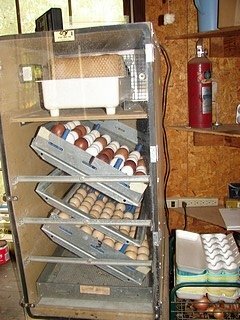 Choosing the correct incubator for the eggs involves learning and understanding the differences between the incubators, provided there is not a setting hen in use. 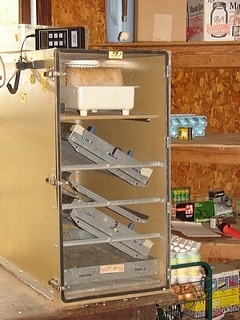 Forced air egg incubators are large incubators ideal for hatching a large amount of eggs. They use a large fan and do not require much attention on the behalf of the person incubating the eggs. They have mechanisms which automatically turn the eggs periodically throughout the incubation process. Still air egg incubators are small incubators ideal for a smaller batch of eggs. They do not use a fan and do require more attention than a forced air incubator. Using a setting hen is the best way to go if there are not many eggs or if another incubator is not available. The hen will do all of the work incubating eggs, but it can be hard on the hen. Make sure the hen is fed well and is allowed to get up and stretch from time to time to avoid any health problems with her afterward. This is generally the toughest part of hatching chicken eggs because it requires the most attention. If using a forced air incubator, the temperature should be 100 degrees Fahrenheit. If a still air incubator is used, the temperature should be 102 degrees Fahrenheit. The thermometer should be placed at the height where the top of the eggs will be. Adjust the heat source as necessary to ensure the temperature is correct. For days 1 through 18, the humidity inside the incubators should be anywhere between 58 percent to 60 percent. From day 18 to 21, the humidity should be increased to 60 percent to 65 percent to protect the eggs from losing moisture. Increase humidity by adding a pan of water below the heat surface, but be careful not to add too much moisture. Following the directions that come with the incubator is the best way to make sure proper moisture is available. Turn the eggs at least two to three times per day, and aim for four to six times per day until day 18. After day 18, turning the eggs could harm the chick inside. For those who are using a still air incubator, eggs will need to be turned by hand, using a marking system to track the number of turns for each egg. Before handling the eggs, hands should be clean to protect the egg. Chicken eggs should begin hatching on day 21. Air vents should be opened slowly as the hatching process begins to ensure the chicks have enough air to breathe. If there are any unhatched eggs remaining on days 25 or 26, these eggs will not hatch, so they should be removed from the incubator and properly disposed. It is natural to expect some eggs will never hatch, even when incubated under the best possible conditions. The incubator should not be placed anywhere near windows or doors as this may cause temperature fluctuations. Use a dependable source of electricity and take steps to prevent the power cord being disconnected from the outlet. If necessary, consider using a battery backup power source to ensure the eggs maintain the proper conditions. If using a light bulb as a heat source, the conditions may be harder to monitor as it is harder to rely on these results. For serious incubators, consider using a heat source that has temperature settings attached to it to ensure consistent appropriate conditions. When knowledgeable about hatching chicken eggs, it is easy to get a good hatch. By paying careful attention to the eggs selected, the incubator and heat source being used, as well as the overall conditions each day of the incubation, people can successfully hatch many eggs. Anyone hatching eggs that have a child may also consider candling the eggs so the children can see the development of the chick until it hatches. Incubating eggs isn't meant for everyone, but it can be quite fun and profitable.